Are the Conservatives really breaking through with ethnic minority voters? June 12, 2015, 9:51 a.m.
Where did the million new Conservative BME voters go? The following is a guest commentary by Robert Ford (University of Manchester), Laurence Janta-Lipinski (YouGov) and Maria Sobolewska (University of Manchester). Last month, the widely respected British Future think tank published new research looking at the ethnic minority vote choices in the last election. The research, conducted by internet polling company Survation, suggested that the longstanding link between ethnic minorities and the Labour party was fraying, and that the Conservatives might at last be breaking through with minority voters, having achieved a 33% share of the 2015 ethnic minority vote overall or “one million” new voters for the party, and with a lead over Labour among Hindu voters. The authors concluded that the gap between the two main parties in support from ethnic minorities is "shrinking dramatically". The report triggered plenty of media and political debate, and fits with earlier research suggesting a gradual erosion in ethnic minorities&apos; traditional partisan loyalties to Labour. However, for keen observers of the results of this year’s election, this story came as a big shock as the seat by seat results suggested the opposite: a swing to Labour and away from the Conservatives in the most ethnically diverse seats. So where did this million new voters go? Analysis of ethnic minority voters on the YouGov panel suggests that the degree of Conservative support among ethnic minority voters, and the shift away from Labour and towards the Conservatives, may not be as large as Survation online data suggests. 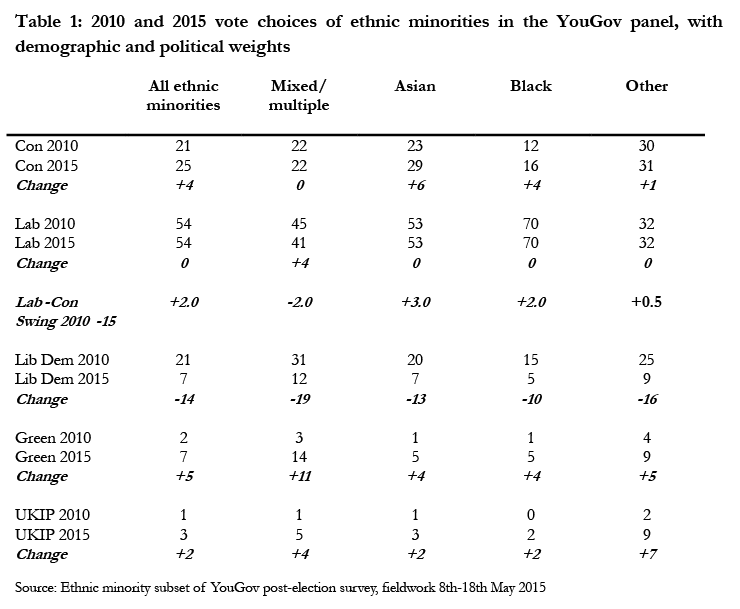 Comparison of 2010 ethnic minority vote choices on the (also online) YouGov web panel with the more comprehensive Ethnic Minority British Election Study (EMBES) conducted in that same year shows that Tory support in the online sample is 10 points higher, and Labour support 13-18 points lower, than among the equivalent groups in the EMBES. This suggests the kind of ethnic minority voters who fill in web panel surveys may be more Conservative leaning, and less Labour leaning, than the overall BME population. 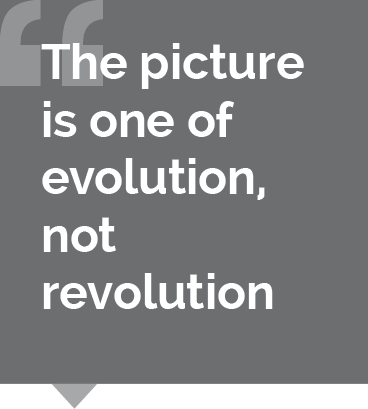 When we take a look at levels and changes in ethnic minority vote choice in a sample weighted to try and correct for these imbalances, the picture is one of evolution, not revolution. The proportion backing Cameron&apos;s party rises four points from 21% to 25%. This is a notable achievement given the party&apos;s historical struggles with minority voters, and the overall swing from the Conservative to Labour in the 2015 election. It does seem that the Conservatives are starting to make modest progress with all ethnic minority groups and in particular we find, like British Future, a particularly strong rise in Tory support from Asian voters. Yet the overall pattern is one of modest advance, not dramatic shifts. There is no evidence of any decline in Labour support overall – they achieve a share of 54% in both years. This is, however, an under-performance relative to the party&apos;s national advance, and suggests that Labour have not benefitted from the collapse in ethnic minority Liberal Democrat support (down 14 points overall) in the way they would have hoped. Instead it is the Greens who make the biggest advance with minority voters, more than tripling their vote share to 7%, with a particularly big surge among the young and rapidly growing mixed heritage electorate. UKIP support also grew among all minority groups, although at 3% the party&apos;s support remains dramatically weaker among ethnic minorities than among white voters. Our results do not support the idea of a dramatic shift in ethnic minority voting behaviour in 2015. Instead, the shifts we find among Britain&apos;s growing minority communities are the same as those found in the wider electorate in England and Wales: incremental Conservative and Labour advance, a collapse in Liberal Democrat voting, and a surge in support for minor party entrants. There are lessons here for both Labour and the Conservatives. The Tories&apos; efforts to appeal to minority voters do seem to be bearing some fruit, particularly among the more prosperous and middle class minorities, but the advance to date is modest and much work is still needed to "close the gap". Labour still receive the majority of ethnic minority votes, but they were unable to grow their support among minorities, despite the collapse of the Lib Dems whose opposition to the Iraq war had won them many ethnic minority votes in the mid 2000s. Our evidence fits with other research suggesting that traditional partisan loyalties to Labour are fading away among ethnic minority voters, producing an electorate more willing to "shop around" and consider a range of other political options, including the Conservatives, the Greens and UKIP. British Future are therefore right to conclude that the ethnic minority vote is increasingly "up for grabs", even if Labour still has a large starting advantage. All parties will need to work hard to appeal for this growing and politically crucial vote in future elections, and much more targeted research is needed to understand ethnic minority voters&apos; concerns and priorities. A more detailed version of this article can be found here. Full tables for the YouGov data used can be found here and here.